Silver Steps™ Antibacterial Toe or Finger Caps protect fingers or toes during everyday activity. Elastic toe protector stretches to fit, surrounding a digit with pressure-relieving, antibacterial protection. As it soothes discomfort from ingrown nails, corns, hammertoes and more, its gel lining slowly releases medical-grade mineral oil to moisturize skin. Toe covers can be trimmed to fit and are comfortable under socks, hosiery and shoes. Set of 4 includes 2 large and 2 small. Silicone toe caps made with 85% nylon/15% spandex. Sprinkle with talcum powder if gel becomes tacky. Do not use on an open wound. They fit my specific need! I have two toes which often give me pain for short periods of time and I'm going to try these to see if it helps. Just trying different things to see what helps. to protect my toes when I wear closed toes shoes. I have used toe caps for several years and find them comfortable with or without socks. Big toes do not have nails. Get sore. Have used before and work great for my thumb. 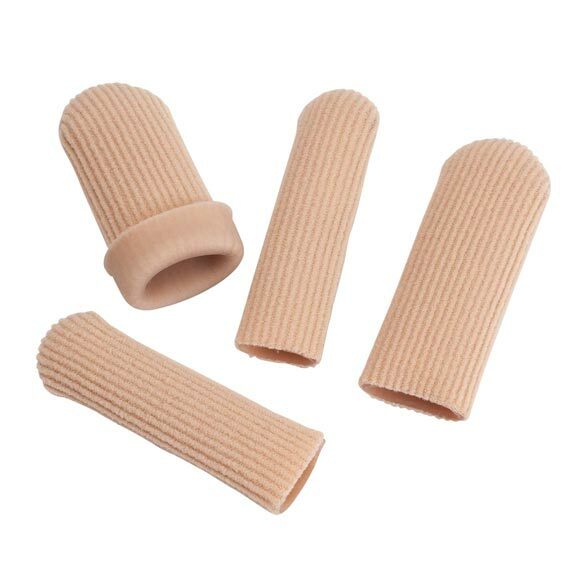 Years ago had frostbite and when weather especially dry thumb skin peels so I use these as protection - works great - soothing and allows time for healing. I have very high arches and this has caused hammer toes. I have a toe that is curling under and the tip stays sore.